Abbie Parr/Getty ImagesDwight Howard (right), playing for the Charlotte Hornets, going up against his future team, the Brooklyn Nets. The Charlotte Hornets have traded Dwight Howard to the Brooklyn Nets, which will be his fourth team in three years and the second offseason in a row that he has been dealt. Howard was once one of the league’s best players, but his game has fallen off and, perhaps more notably, he appears to cause locker room problems wherever he goes. Howard has now been traded two years in a row for highly overpaid players, so it seems that teams are just desperate to get rid of him. 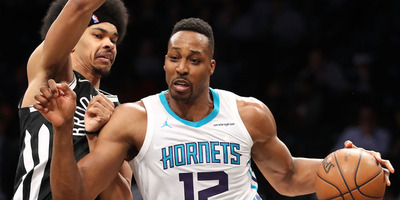 The Charlotte Hornets are trading Dwight Howard to the Brooklyn Nets, according to a report from ESPN NBA reporter Adrian Wojnarowski. This means that Howard, who as recently as 2013 was one of the NBA’s most coveted free agents, is set to play on his fourth team in four years, and this is the second straight offseason he has been traded, and in both instances for mediocre players (Miles Plumlee and Timofey Mozgov respectively) who are on excessively large contracts. It is a hard fall for a player who was once a perennial All-NBA player and won three straight Defensive Player of the Year awards. Lowe did not specify why exactly Howard is so disliked, but his style of play could be a possibility. Howard demands post-ups that bring the flow of the offence to a halt when he is in the game, despite not being a very good post player and the league as a whole moving away from that style of play. Whatever the cause, with Howard being moved multiple times for players on such bad contracts, it looks like teams are desperate to get rid of him.